We often use little tasks to investigate an infant’s behavior. We might for instance show your child two pictures and then observe his or her reaction. Does s/he look longer to one of the pictures? Is s/he trying to pick one of the pictures up? Or does s/he not seem interested in the pictures at all? We usually do a video recording of such tasks, so we can afterwards analyze different aspects of the task, for instance how long your child looked to which side. We can thereby learn which picture looks more interesting to your child. Does s/he for instance look longer to happy or to fearful faces? One important part of our research are questionnaires, which we will usually ask you to fill in at home. No one knows your child better than you, so we need your help to learn more her or his everyday behavior and environment. 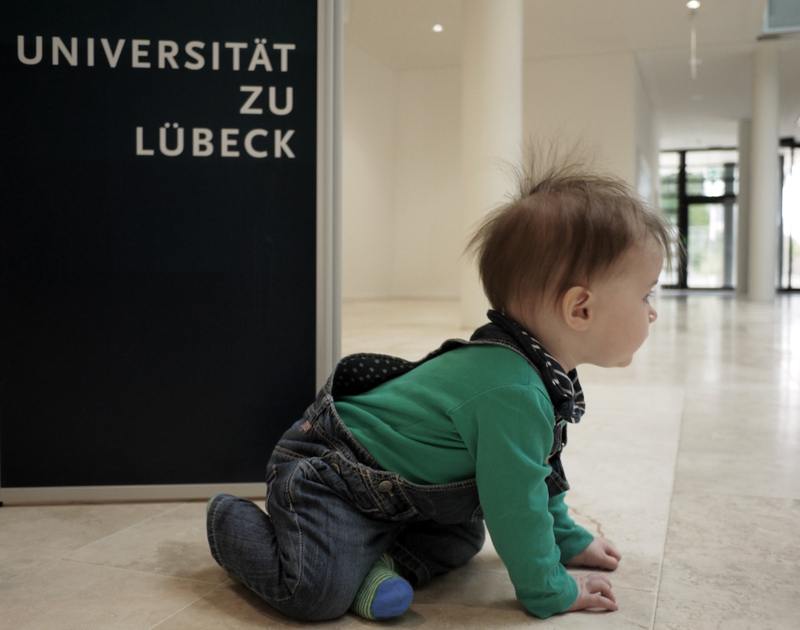 Already very young children have their own personality which of course impacts their behavior, and so it is very important for us to take this aspect into account in our research. We are especially interested in how a baby’s brain develops and what is happening in a baby’s brain in social and emotional situations. To investigate these questions, we use electroencephalography, or short, EEG. The mechanisms behind an EEG measurement is pretty straight-forward. Brain cells communicate with each other by means of very small changes in electric current. Using specially designed sensors, so-called electrodes, we can detect these change on the surface of the head and make them visible on a computer screen. Your child doesn’t notice anything from this measurement and is free to behave as it normally does. The sensors are attached to a little hat, which looks a bit like a bathing cap. 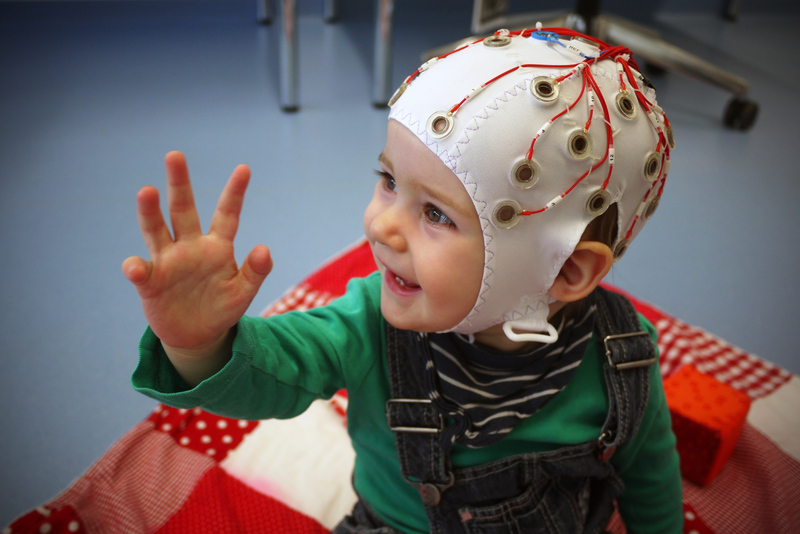 To record the EEG, we will therefore put one of these hats on your child’s head. After that, we will use some skin friendly gel to improve the signal conductance between the head and the sensors. During these preparations, your child will be sitting on your lap and you or one of our students can play with your child to keep him/her occupied. In total, the preparations usually take 5 to 10 minutes. Depending on the study, your child can either remain seated on your lap during the experiment, or we will seat your child in an age-appropriate car seat positioned on the floor. In either case, you will be with your child at all times. After the recording, we will remove the hat and use a some warm water to wash any remaining gel out of your child’s hair.